This necklace is something rather special and unique. The sweet little elephant charm is symbolic of wisdom, reasoning, strength and good luck, and with its tiny sparkling CZ heart, this makes the perfect gift for a loved-one to encourage them to meet any challenges when embarking on new adventures, taking an exam or taking part in a competition. 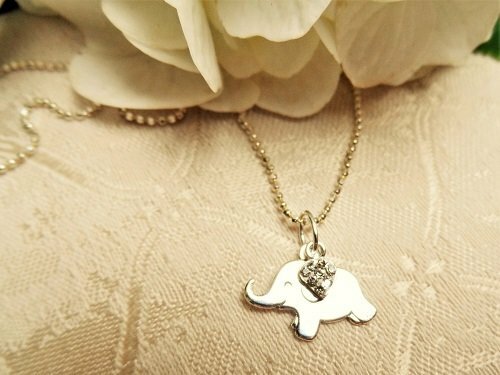 Description: Our lucky elephant necklace consists of a small sterling silver elephant charm that measures 15mm in length including the hanging ring, and a tiny cubic zirconia (CZ) and sterling-silver heart on an 16" sterling silver diamond-cut ball chain. An 18" or 20" option is also available: Please choose in options box. The CZ heart is either clear crystal or pink: Please choose. In many cultures the Elephant is associated with good luck, especially with its trunk upwards which indicates a showering of good fortune and prosperity. It is also symbolic of strength, wisdom and perseverance. You can trust an elephant!